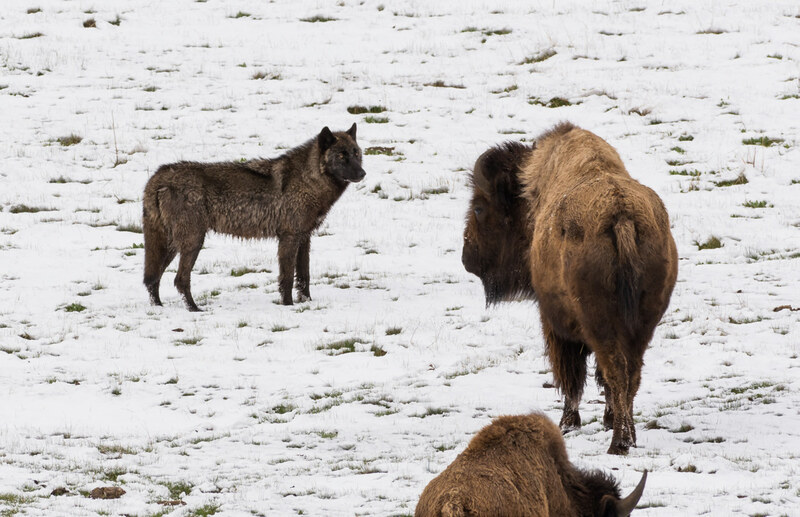 A wolf eyes a bison in Yellowstone National Park. Wolves are not our enemy. People have been hunting, trapping, poaching and poisoning wolves for centuries. From the 1930’s through the 1960’s, wolves were nearly wiped out from their historical habitat. However, before the wolf population deteriorated any further, wildlife advocates stepped in to help save these precious creatures. Wolves outside of Alaska were classified as endangered in 1973 by the Endangered Species Act. Plans for the repopulation of the predators back into the Rocky Mountains and Yellowstone National park followed. In 1994, legislation for the reintroduction of wolves was approved. The following year wolves were released into central Idaho and Yellowstone National Park, where they soon scattered and began to thrive. The wolves’ recovery plan prospered, and populations stabilized in the late 2000’s. In 2011, President Obama removed the gray wolves from the Endangered Species List in the Northern Rockies. Between 2011 and 2015, 1,243 wolves were killed by hunters in Idaho, and 827 wolves were killed in Montana. In Wyoming, 148 wolves were slaughtered, which was over a third of the population. These statistics don’t include the wolves that were killed by Federal and State Predator Control programs. Wolves are scientifically proven to be vital to an ecosystem. This has been demonstrated within studies of wolves in Yellowstone National Park. Since their introduction in 1995, wolves have changed the behavior in deer and elk, moving them into wider open areas where they are less likely to be cornered and killed. This has caused a rejuvenation in plants such as aspen trees, shrubs, willows, and cottonwood. The wolves’ arrival also helped control the coyote population. This allowed the populations of rabbits, badgers, foxes, and ferrets to flourish in the Yellowstone area. This phenomenon is called a trophic cascade, which is an ecological occurence triggered by the addition or removal of top predators. There are several misconceptions that contribute to the perception that wolves are our enemy. If you look at the big picture, you’ll find they aren’t dangerous. For starters, it has been proven that wolves are not the only major problems for livestock. Coyotes and elk also cost ranchers thousands of dollars each year. “In 2010 the national cattle inventory was ninety-four million head,” said Yuskavitch. Five percent of those animals died within that year, an average of 90 percent of their deaths were due to health and weather related issues, only .3 percent of these deaths were attributed to wolves. Although the recorded number of attacks on humans is minimal, unfortunately a negative perception of wolves still exists partly due to common misconceptions stemming from fairy tales such as the Little Red Riding Hood. The best any of us can do is learn to work and coexist with these primal, intelligent, and beautiful creatures of the wild. There are many opinions on the wolf population in the Rocky Mountains, and how to manage it. Hopefully, with a little effort, humans can coexist with wolves. I hope that Mowat’s quote helps you consider that wolves are far from savage ruthless creatures, and let’s face it, we are too old to believe in The Big Bad Wolf.